Yesterday your phone could tell you where you were within a few meters. Today, with Trimble Catalyst, your phone can tell you where you are within just a few centimeters. Catalyst features a lightweight antenna that plugs directly into your Android phone or tablet’s USB port. 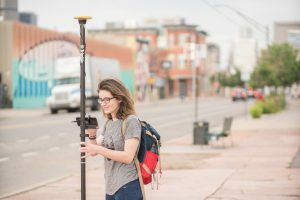 Once it’s connected to any Catalyst-ready or third party location-enabled app, you can use measure, locate, and share the things you map with the world. The little blue dot on your phone just got a whole lot smaller and more accurate. And, since Catalyst’s revolutionary technology features a software GNSS receiver that delivers high accuracy positioning with an on-demand subscription service, you only pay for it when you need it. So get ready to get insanely close to your world. Whenever, wherever you want to.